I love to connect with mothers and support them through the many physical and emotional changes that occur during pregnancy. Experience an enjoyable pregnancy massage that specifically targets areas of discomfort to provide relief to the neck, back and tired legs. 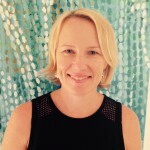 Using specialised techniques I will work to alleviate pain and discomfort, whilst heightening relaxation for you. My aim is to guide you safely through your pregnancy with a focus on health, well-being and relaxation. The correct positioning is very important. While there are tables with cutouts for the stomach, these are not recommended by Pregnancy Massage Australia. The side-lying position is the most supportive as it eases the lumbar spine, supports the pelvis and minimises strain on uterine ligaments. For this reason, during your 2nd and 3rd trimester I do a beautiful side-lying massage supported by comfortable pillows. All of my clients find this positioning extremely comfortable and relaxing. I also provide post natal massage. Massage in this time has shown to improve the health and well-being of the new mother. Massage alleviates postpartum aches and pains, particularly the demands of breastfeeding which can cause pain in the upper back, neck and shoulders. I use a Body Cushion which is perfect to alleviate pressure on the breasts that provides very comfortable cushioning allowing you to lay comfortably face down. 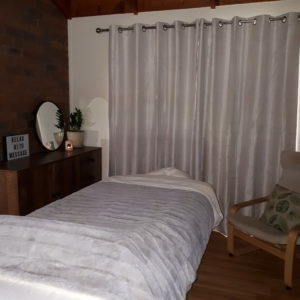 Book a mobile massage or book a massage @ my place in Little Mountain. 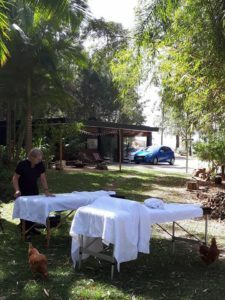 I recently booked for my sister’s hens and I can’t speak highly enough of this service. 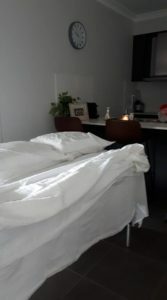 We had a beauty therapist and a massage therapist come to the house, both of whom were so lovely and very professional. The bride-to-be and guests loved being pampered. I would highly recommend this service. Very professional and on time. Highly recommend. 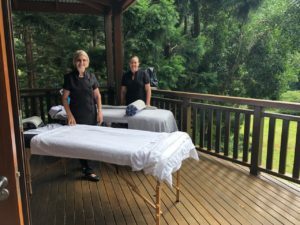 Many thanks Renee for organising our massages. Helen was amazing!! We all agree it’s the best massage we have had. We will be using your services again sometime very soon!! Many thanks again. A really excellent service. On time and a pleasure to deal with! Dear Renee, Paula & Juliette, thank you so much for the most amazing massages. We absolutely loved it! Was so awesome, thank you for the whole experience!! 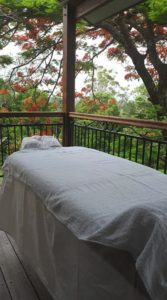 In the Sunshine Coast for a baby moon and had the most amazing massage in our rainforest chalet. I am a physiotherapist so I am quite particular about this therapy and Anita was amazing!! Made you feel like a princess! !